Morneau played hockey growing up, and attended a training camp with the Portland Winter Hawks as a goaltender on the team's 50-man Protected Player List. Morneau chose his jersey number (33) for legendary NHL goalie Patrick Roy. He has been swinging a hot bat lately! Last Thursday, Justin Morneau tied a career high with 5 hits in a game as his visiting Minnesota Twins beat the Detroit Tigers 7-6 in 11-innings. He hit what went on to be the game winning home run to finish the day 5 for 5 with a walk. Justin scored the winning run for the American League last night in the MLB All Star Game at Yankee Stadium. It went 15 innings, the longest All-Star Game in history. Just in...Just out...of the park! 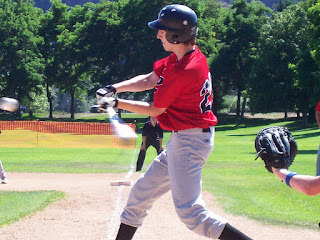 15-year-old Justin Hass (above) of Kelowna, BC had the best game of his baseball career last Sunday! the Kelowna Cubs beat Ladner to finish third in the Valley of Champions bantam tournament. 9-4. A-Rod moved past another Yankee legend, Mickey Mantle, for sole possession of 13th place on the all-time list. 13 is also a good number for Justin. He was born on June 13 and it was July 13 he had the game of his life! By the way, after Justin's birthday last month, our three kids now have a cumulative age greater than mine...so you can consider me a younger man now...and shorter...you see, Justin recently passed me (5 ft 10 1/2 in) in height. Yesterday I did some on-hold messaging for a company in Sweden. Some might say Mats Sundin is a Swedish "meatball" for not accepting the Vancouver Canucks' $20-million, two-year deal this week. If he does return to the NHL, I think he would opt for a team that has a real chance at the Stanley Cup - like the Detroit Red Wings, who got the "steal of a deal" by signing Marian Hossa to a one-year deal worth $7.4 million dollars. Sundin's countryman, Markus Naslund, has left the Canucks for the New York Rangers so I don't think that move will sway Sundin to the west coast - even though super Swedes like Daniel and Henrik Sedin (click here for their hilarious commercial), Mattias Ohlund and former Kelowna Rocket Alexander Edler are still in the fold. The Canucks traded for Buffalo winger, Steve Bernier, today while Buffalo got a solid defenseman from San Jose, Craig Rivet. defenseman Dennis Persson and goalie Jhonas Enroth. As far back as 1984 and 1985, Buffalo picked Swedish-born players in the first round of the draft. You can see all the draft results here. Young hockey players (17 and under) will be taking to the streets of Buffalo next month. Click here for details on HockeyFest. The big winner on the opening day of the NHL Free Agent season was former Buffalo Sabre Brian Campbell. The Strathroy, Ontario native has joined the up and coming Chicago Blackhawks, where he signed an eight-year deal worth $56.8 million dollars! Buffalo native and the NHL Rookie of the Year, Patrick Kane, is one of the young guns Campbell will be passing to a lot. Here are my voiceovers for the before and after MSG-TV footage of Patrick Kane leaving a memorable mark in Buffalo last season. Former Kelowna Rocket, Duncan Keith, had a great season on defense for Chicago and even made the All-Star game roster in January - just like Brian Campbell. After the season (which he finished with San Jose), Campbell made the NHL's 2007-08 Second All-Star Team. There is another Kelowna connection to Chicago: Kyle Beach. He was picked in the first round, 11th overall, in last month's NHL Entry Draft. His Uncle Gregg is helping coach my son Justin's summer baseball all-star team. We are known as the Kelowna Cubs. This year the Chicago Cubs are playing very well and might win their first World Series in 100 years!